The ’Sconset Trust is a membership-supported nonprofit organization dedicated to land conservation and historic preservation in and around the village of Siasconset, Massachusetts on the island of Nantucket. 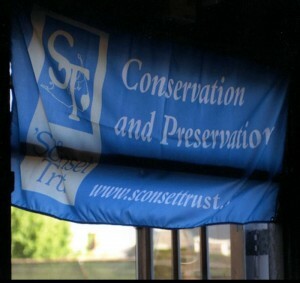 The Trust was created in 1984 to help preserve the natural environmental beauty and unique character so important to the quality of life in Siasconset, known locally as ’Sconset. Prior to the formation of the ’Sconset Trust, there was no foundation or other entity in ’Sconset that was in a position to receive gifts (whether of land, cash, or securities) on a tax-deductible basis. It was the Nantucket Conservation Foundation leaders who suggested the formation of the Trust, and while these two entities now work closely together, they do not overlap or duplicate each other’s work. The ’Sconset Trust achieves its goals by accepting tax-deductible gifts of open land in and around the Village, by receiving donations to buy land, and by encouraging owners to place use restrictions on their property. The Trust has taken ownership of more than 130 acres of land through these methods. In addition it holds two preservation easements and one conservation easement. Its holdings throughout the Village are identified by blue property markers. In September of 2007, the Trust took ownership of the historic Sankaty Head Lighthouse from the United States Coast Guard. Within days of the transfer of ownership, the Trust commenced on a major project to relocated the lighthouse away from the eroding Atlantic bluff in ’Sconset. On October 20, 2007, the relocation project was completed under the leadership of the Trust and International Chimney Corporation, the lead contract and engineer. Over the following 12 months, the lighthouse and the grounds were restored and now serve as a significant island historic destination for residents and visitors.